Among the small group of heterodox economics people interested in corporate finance, it is common knowledge that the stock market is a tool for moving money out of the corporate sector, not into it. Textbooks may talk about stock markets as a tool for raising funds for investment, but this kind of financing is dwarfed by the payments each year from the corporations to shareholders. Instead of promoting investment, the U.S. financial system seems to do quite the opposite… Take, for example, the stock market, which is probably the centerpiece of the whole enterprise. What does it do? Both civilians and professional apologists would probably answer by saying that it raises capital for investment. In fact it doesn’t. Between 1981 and 1997, U.S. nonfinancial corporations retired $813 billion more in stock than they issued, thanks to takeovers and buybacks. Of course, some individual firms did issue stock to raise money, but surprisingly little of that went to investment either. A Wall Street Journal article on 1996’s dizzying pace of stock issuance (McGeehan 1996) named overseas privatizations (some of which, like Deutsche Telekom, spilled into U.S. markets) “and the continuing restructuring of U.S. corporations” as the driving forces behind the torrent of new paper. In other words, even the new-issues market has more to do with the arrangement and rearrangement of ownership patterns than it does with raising fresh capital. Note that in the passage I quote, Doug correctly writes “takeovers and buybacks.” But a lot of other people writing in this area — definitely including me — have focused on just the buyback part. We’ve focused on a story in which corporate managers choose — are compelled or pressured or incentivized — to deliver more of the firm’s surplus funds to shareholders, rather than retaining them for real investment. And these payouts have increasingly taken the form of share repurchases rather than dividends. In telling this story, we’ve often used the negative net issue of equity as a measure of buybacks. At the level of the individual corporation, this is perfectly reasonable: A firm’s net issue of stocks is simply its new issues less repurchases. So the net issue is a measure of the total funds raised from shareholders — or if it is negative, as it generally is, of the payments made to them. 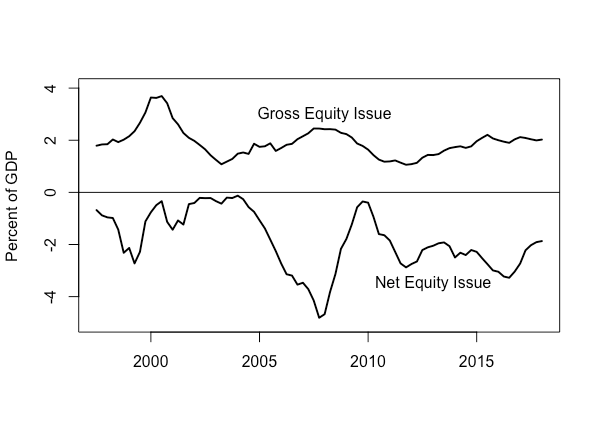 It’s natural to extend this to the aggregate level, and assume that the net change in equities outstanding similarly reflects the balance between new issues and repurchases. William Lazonick, for instance, states as a simple matter of fact that “buybacks are largely responsible for negative net equity issues.” 1 But are they really? If we are looking at a given corporation over time, the only way the shares outstanding can decline is via repurchases.2 But at the aggregate level, lots of other things can be responsible — bankruptcies, other changes in legal organization, acquisitions. Quantitatively the last of these is especially important. Of course when acquisitions are paid in stock, the total volume of shares doesn’t change. But when they are paid in cash, it does. 3 In the aggregate, when publicly trade company A pays $1 billion to acquire publicly traded company B, that is just a payment from the corproate sector to the household sector of $1 billion, just as if the corporation were buying back its own stock. But if we want to situate the payment in any kind of behavioral or institutional or historical story, the two cases may be quite different. Until recently, there was no way to tell how much of the aggregate share retirements were due to repurchases and how much were due to acquisitions or other causes.4 The financial accounts reported only a single number, net equity issues. (So even the figure above couldn’t be produced with aggregate data, only the lower line in it.) Under these circumstances the assumption that that buybacks were the main factor was reasonable, or at least as reasonable as any other. Recently, though, the Fed has begun reporting more detailed equity-finance flows, which break out the net issue figure into gross issues, repurchases, and retirements by acquisition. And it turns out that while buybacks are substantial, acquisitions are actually a bigger factor in negative net stock issues. Over the past 20 years, gross equity issues have averaged 1.9 percent of GDP, repurchases have averaged 1.7 percent of GDP, and retirements via acquisitions just over 2 percent of GDP. So if we look only at corporations’ transactions in their own stock, it seems that that the stock market still is — barely — a net source of funds. For the corproate sector as a whole, of course, it is still the case that the stock market is, in Jeff Spross’ memorable phrase, a giant money hose to nowhere. 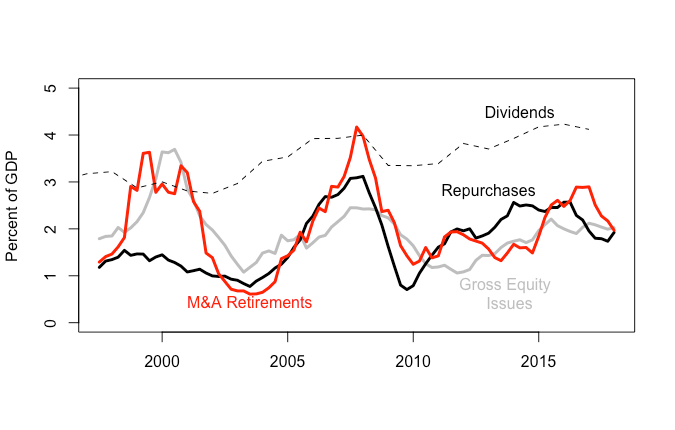 The figure below shows dividends, gross equity issues, repurchases and M&A retirements, all as a percent of GDP. What do we see here? First, the volume of shares retired through acquisitions is consistently, and often substantially, greater than the volume retired through repurchases. If you look just at the aggregate net equity issue you would think that share repurchases were now comparable to dividends as a means of distributing profits to shareholders; but it’s clear here that that’s not the case. Share repurchases plus acquisitions are about equal to dividends, but repurchases by themselves are half the size of dividends — that is, they account for only around a third of shareholder payouts. One particular period the new data changes the picture is the tech boom period around 2000. Net equity issues were significantly negative in that period, on the order of 1 percent of GDP. But as we can now see, that was entirely due to an increased volume of acquisitions. Repurchases were flat and, by the standard of more recent periods, relatively low. So the apparent paradox that even during an investment boom businesses were paying out far more to shareholders than they were taking in, is not quite such a puzzle. If you were writing a macroeconomic history of the 1990s-2000s, this would be something to know. It’s important data. I think it clarifies a lot and I hope people will make more use of it in the future. We do have to be careful here. Some fraction of the M&A retirements are stock transactions, where the acquiring company issues new stock as a kind of currency to pay for the stock of the company it is acquiring.5 In these cases, it’s misleading to treat the stock issuance and the stock retirement as two separate transactions — as independent sources and uses of funds. It would be better to net those transactions out earlier before reporting the gross figures here. Unfortunately, the Fed doesn’t give a historical series of cash vs. stock acquisition spending. But in recent years, at least, it seems that no more than a quarter or so of acquisitions are paid in stock, so the figure above is at least qualitatively correct. Removing the stock acquisitions — where there is arguably no meaningful issue or retirement of stock, jsut a swap of one company’s for another’s — would move the M&A Retirements and Gross Equity Issues lines down somewhat. But the basic picture would remain the same. It’s also the case that a large fraction of equity issues are the result of exercise of employee stock options. I suspect — tho again I haven’t seen definite data — that stock options accout for a large fraction, maybe a majority, of stock issues in recent decades. But this doesn’t change the picture as far as sectoral flows goes — it just means that what is being financed is labor costs rather than investment. The bottom line here is, I don’t think we heterodox corporate finance people have thought enough about acquisitions. A major part of payments from corporations to shareholders are not distribution of profits in the usual sense, but payments by managers for control rights over a production process that some other shareholders have claims on. I don’t think our current models handle this well — we either think implicitly of a single unitary corporate sector, or we follow the mainstream in imagining production as a bouillabaisse in where you just throw in a certain amount of labor and a certain amount of capital, so it doesn’t matter who is in charge. Of course we know that the exit, the liquidity moment, for many tech startups today is not an IPO — let alone reaching profitability under the management of early investors — but acquisition by an established company. But this familiar fact hasn’t really made it into macro analysis. I think we need to take more seriously the role of Wall Street in rearranging ownership claims. Both because who is in charge of particular production processes is important. And because we can’t understand the money flows between corporations and households without it. This piece also includes the often-heard claim that buybacks reward the shareholders who sell but not those who continue holding their stock. Given that buybacks are made at the market price, and that their state goal is to raise the share price, this claim has never made sense to me. I’m sure this isn’t literally true but I can’t think of any others. The use of “cash” in this context is a nice illustration of how moneyness describes a continuum, not a distinct set of assets. We can see this at the firm level to some extent, but it’s not at all straightforward to go from the data reported by publicly-traded corporations in Compustat or similar databases to the aggregate statistics. And while corporate filings do report acquisition spending, they don’t say anything about whether the acquired companies were already publicly traded, which is essential for this purpose. The use of stock as payment for acquisitions is a nice demonstration of Minsky’s dictum that “anyone can make money” — that it isn’t a monopoly of the state or even the banking sysetm. Do you know how these aggregates account for privately-held equity interacting with public companies? Suppose a VC firm invests $10 million each in 10 startups (A through J), of which 7 (D through J) go broke, two (B and C) stay roughly break-even for years, and one (A) gets acquired by a public company for $150 million. Which, if any, of these transactions show up in the aggregates? Does it matter if A goes IPO first for $120 million? Acquisition of startups is an important form of investment at least in the tech industry (though I’m not sure how it compares with other R&D spending), and the willingness of companies to spend this way is the main reason the VC firms are willing to make the initial investment in the startup in the first place. Good questions. I’ve been wodering about this too. I believe that acquisition by a PE firm does not in itself affect the equity issue numbers, tho it’s subsequent sale might. I don’t know if bankruptcies count as negative equity issues, or just as valuation change (I suspect latter, but without much confidence.) With respect to your last case: If a $120 million IPO is immediately followed by a $150 million cash acquisition, I am pretty sure we will see a net equity issuance of negative $30 million. But I really need to find someone at Fed to talk to about this. If you wanted to push this further you could get some of this out of CRSP. When firms are delisted there’s a CRSP code for the reason why. You won’t see private-private acquisitions, but you will see the others. There’s an alternative explanation for some of these findings, which is that the US stock market is slowly dying out. One sign of this is that the number of listed US firms is in decline. Doidge, Karolyi, and Stulz’s paper on the listing gap talk about this. I should definitely look at that. There is a big problem, unfortuantely, with matching firm-level data to the aggregates published by Fed and BEA. But still informative. One issue here is the salience of publicly traded corporations specifically, either for theory or accounts. As far as I can tell, the accounts don’t distinguish between publicly traded corporations and ones held by PE funds and similar. Both have equity, pay dividends, have a clean separation between profit and wage income. There isn’t a specific category for PE and VC in the accounts at all. The implicit assumption is that you have small owner-operated firms and publicly traded corporations, with financial entities holding shares of the latter (among other assets). The accounts are not set up for the case of a corporation as a whole owned by a fund, which is obviously becoming more and more common. I’m sure there are people in the national-accounts world who have thought about this problem, but I have no idea if there’s any discussion of reorganizing things to reflect the new institutional realities. Another way for outstanding shares to decline in an ongoing corporation (your footnote 2) is a reverse stock split. This can happen, e.g., when a company’s stock price gets low enough that it is threatened with delisting on an exchange, or not being eligible for options trading. The net equity term definitely does not include splits and reverse splits. It is a measure of the dollar value of share issues, not of changes in the number of shares outstanding.